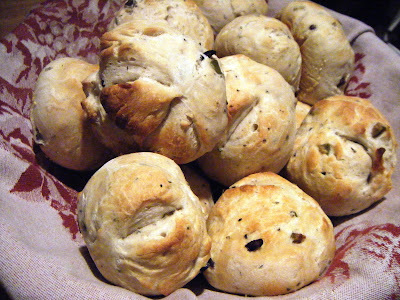 KPLU recently re-ran the “Food for Thought” episode where I talked about my recipe for Rosemary Olive Rolls. Though calling it “mine” is stretching the truth. It’s actually a recipe from Peter Dow’s Cafe Juanita. The last time I ate there — back in the pre-Holly Smith days — those housemade rolls were served with the meal, and when I asked for the recipe chef John Neumark was kind enough to comply. 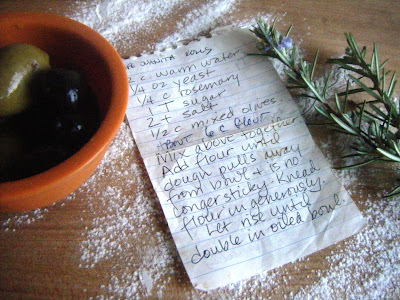 My friend Barbara scribbled it down on a notepad, and more than a decade later it holds a hallowed place in my old-fashioned recipes file. “Nancy’s” Cafe Juanita Rolls recipe, the hand-written version. After the radio show aired I got a ton of e-mail from folks asking for the recipe, which is an easy one to make. Especially if you’re like me and you always keep olives in the fridge and have fresh rosemary planted outside. (Check out that photo, taken this morning, with my just-picked rosemary already producing lavender-hued blossoms! Nice weather, huh?) And seeing how many Eaters have tried (and succeeded) in replicating my other favorite roll recipe, I figured I’d share the love here on the blog, too. Give it a bake this weekend and feel free to get into the comments-box on this post afterward and tell us how yours come out, OK? Here’s how my rolls came out last week. Note: If you’ve got a standing mixer, this is a breeze. And it’s pretty easy even if you’re using a large mixing bowl, a sturdy spoon and your hands. The dough can be prepared earlier in the day for baking later: just keep it covered, and keep punching it down till baking time. 1) Warm the mixing bowl, rinse. 2) Add the water to the warmed bowl, sprinkle in the yeast and sugar, and stir to combine. Let sit a couple minutes. 3) Add salt, chopped rosemary and chopped olives: stir. 5) Let dough rise in an oiled bowl (covered with a cloth) until doubled. 1) Form dough into small balls (about the size of a tangerine) and place on a cornmeal-lined baking sheet. 2) Let the rolls sit and rise for about 20 minutes. 3) Slash the top with two cuts (kitchen shears work great! ), brush with the melted butter.